British actor best known for roles in films such as DOOM (as Destroyer), 7 Seconds, Dredd and Pirates of the Caribbean: On Stranger Tides. This photo is by Duncan from a Collectormania event in 2014, he had 1/4in more shoe this shot. He once said "I'm 6”6 and 265 lbs so I sweat a lot". I agree with you on barkley being on the 6'4.5 mark.He could have also shrunk a bit by now since he's in his 50s. I guess there would be a difference max 1/8 inch. @Canson: I bet he would. Do you think he's standing better than Rob in this pic? If not, I honestly think he looks 6'5 flat here. Looks 6'5.25 with footwear advantage . Take his footwear into account and he is just under 6'5". 6'4.75" and has the right to claim 6'5". Other guys claiming 6'5" Like Lundgren, Momoa, and the Rock would be looking up a good bit to this fellow. rob the strange thing with this guy is that in the photo he really look 6 foot 5 and i believe you if you say he is.could be 1/4 wrong of course but how was dwayne jhonson able to look only 3-3,5 cm shorter than him in those photos? well we dont see their shoes. but there is no way there is 5 cm difference in height by looking at the photos.dwayne looks like a legit 192 guy beside him. those steroid guys are hard. one year they look a height and then 5 years later they look 1 inch shorter. In Doom I think Rock still looked 6ft 3 and Oparei 6ft 5. Take his footwear into account, he is something like 6'4.75 to 6'5. Certainly not the 6'6" he claims. Im not really sure on Oparei he could be either 6ft 5 or 6ft 4.75 its a toss up for me, what do you think is likier for him Rob? 6ft 5 or 6ft 4.75? @Rob: he has an abnormally sized head. It's tough to pinpoint his height honestly. Editor Rob: I wouldn't have said abnormal, just a good 10 and a bit inches, although I know my head is further from the camera there. Rob, I just saw Deobia on a Minder episode from 1993. He did look around 6'5" then, so I can go along with this height. Editor Rob: Ned, he really is probably around 6ft 5 on the nose and 6ft 6 in shoes, I'd be surprised if 6ft 6 barefoot. He's got great posture for a big fella. Must do a lot of stars! Wow that dude is big you say 6 5 and believe it. He was bigger than all of cast of Doom no counting the cg monster that killed him.. He could likely puff up and try for the half but I dont see 6 6. His claim could be school or college a man that large would likely have back knee and neck injuries. Mine cost me 3/4 of an inch and im short to begin with. He looks as listed and seems very happy about it too! Rock probably thinks this guy is 6ft7! Exactly 6'5 minus the .25 shoe Advantage, 6'4.75". Large Fellow this guy is holy smoke. Comfortably taller than guys who are listed at 6ft 4. I wouldn't put him under 6'5", he has barely any hair compared to guys like Joe or Tom. Looks 6'3 against 6'0.5 Tom Wlaschiha. What do you say, Rob? Editor Rob: in person he's a big fellow, at least 4 inches taller than Tom up close I feel. Rob,who looks taller,This gentle,Hopper or Joe ? Editor Rob: I think they both are within similar zone, barefoot I wouldn't think they would measure much different. Hopper standing on his own, he has a frame that adds to an overall taller impression - I've no doubt people guess Hopper over 6ft 5 in person. Deobia has more upright posture than Rob plus thicker shoes, and he's still not quite a head taller. 6'4.5" seems best for him. He could be 195cm, but no higher than that. Rob, who's taller Deobia or Joshua? Editor Rob: Joshua looks taller in person. I meant better than the photo you posted... In that photo, The Rock looks to close to him to be true! Look at him with a measured 6'4.75 guy like Charles Barkley, i think you can safely say there are 3 inches between them! The Rock is a strong 6'2 today and maybe 6'2.5-2.75 at his peak! 6'2.5 for The Rock who in 2005 was still 33 (so certainly still at his "peak") and 6'4.75 for Deobia could be on the money! Lonestar --> Deobia was way off an inch taller than the rock. There were 4-5cm between them. This is true, I had to say that Deobia can't be 191cm. Rampage --> Yes, I agree 100%. 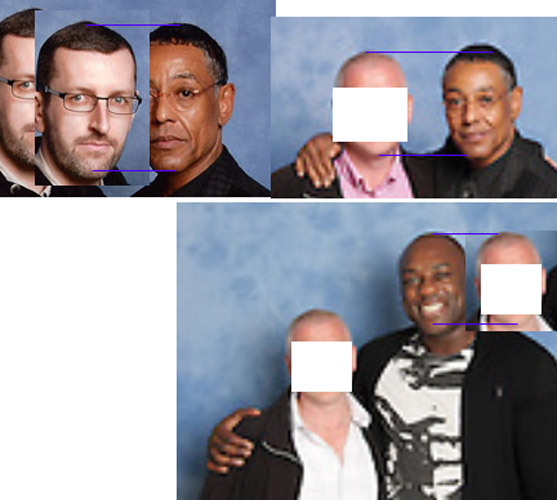 AlexMahone, Deobia was way off an inch taller than the rock. There were 4-5cm between them. Rob this guys eye level should be 13 cm? If he's 6ft3 then The Rock is 6ft1-2! Please show here a picture where Oparei is 1 inch taller than The Rock and we see the footwear as well. The pictures what are you talking about taked way back in 2005. I think The Rock was in those days near to 6'4 (193cm). Deobia is looking like a legit 6'5 next to Rob. Michael Sam was measured at 6'1.5 at the senior bowl. Yeah Alex, an inch does seem a bit too much but who knows. Maybe his hair used to add some extra height. The Rock also had a Slimmer Taller looking build back in 2000 - 2002. Dwayne Johnson was at least an inch if not more taller than Paul Walker in the recent fast and furious movie. I doubt he's below 6'3". @Alex 6'0: For sure I believe that Rock used to be taller. Could look 6'3'' - 6'4'' easily in the ring. Today he struggles to look taller than someone like Cena who is very honest about his height. Yeah I think Rock is a solid 6'2'' today. Height182, yea I didn't really notice the footwear advantage. Prob very minimal. So youd agree perhaps 6'2.5 peak and today 6'2. I think 1/2 inch at most he's lost prob less. 6'2 1/2 peak and today 6'2-6'2 1/4. Yea he does look just 2 inches over Cena who I have at 6'0-6'0 1/4. Height182, maybe Rock went from 6'2.5 to 6'2 flat nowadays? A legit 6'2.5 can pull off 6'4 to people in person let alone on TV plus with a muscular build it can make you appear a bit taller. If Rock lost height Im thinking 1/4 to 1/2 inch tops. @Alex 6'0'': Rock also had footwear advantage over Orton. Yeah it must be the last few years he's lost height. I don't think Rock would measure anything more than 188cm today. The guy barely had 2 inches over Cena, In almost every segment/event. @Judd i think Deobia is a solid 6ft 5. Is what I've just said....I have your approbation, Connor? This good evidence Rob that Dwayne Johnson is 6'3 ? Didnt look more that 2inches difference in most photos. In fact looked more 1.5 inches. Great...at least we can put the below 6ft4 claims for Salmon to bed. Rob are you sure there was less than 1in between this guy and Colin Salmon? [Editor Rob: Deobai is a much better photo as he's standing pretty much perfectly. but yes, up close I really don't think there's much between those 2 guys. I really do think The Rock has lost some height. I really don't know what it is, but Rock could pull off 6'4'' to me in the 90's. Yet then, he was a SOLID 2 inches shorter than Randy Orton in 2004 face to face. Rock was in boots and Orton was in regular dress shoes. Strange. Rock is 6'3, and this dude is 6'5, makes sense. Account for the difference in posture, he doesn't look anything over 6'3 with your 5'4 friend Rob. This proves too me Dwayne Johnson has always been a lift wearer. vosloo is listed 6ft 1.75 here so would be about 6'3 in the shoes he is wearing if that listing is correct. He's got a huge head or is it just a camera effect, Rob? He looks about 6'5, yeah, but in the picture with The Rock that Vegas posted (your link doesn't work) he doesn't even look 6'4! And The Rock is not even 6'3! Looks a decent enough 6'5 to me. I know you get asked this question on every page with someone listed as 6'5 but...as tall as HC15 in person Rob? 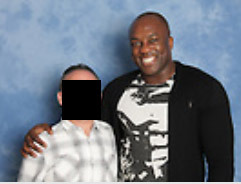 I met Deobia Oparei , in fact I had his contact and lost it . I would like to reestablish this conection but I guess it is somehow difficult. He is indeed very tall.